I’m Lynn, and I’m a mum living in Glasgow with my husband and our two riotous children: the spirited, eternally climbing almost school-age little lady and the tireless (and tiring) toddler-aged little man. Not forgetting our wonderfully patient labrador. I like to get out and about, and when the little lady was born I was out constantly, trying out anything baby related we could find and meeting lots of other fantastic mummies and babies in the process. That’s how it all started. I found classes, cafes & restaurants that were/were absolutely not baby friendly, places to go, things to do and decided to document all the stuff I could find on a wee facebook page in reviews and links. My hope was that it would help others find things to do with their little ones, to meet other new mums & babies, and so the cycle would continue! It grew into quite a big facebook page. Now we have a website. The little lady, her little brother and I still explore Glasgow and it’s surrounds on an almost daily basis (when they’re not in nursery) trying to find new places to go and things to do, and I still write about them. And I’m dabbling in a bit of blogging too. 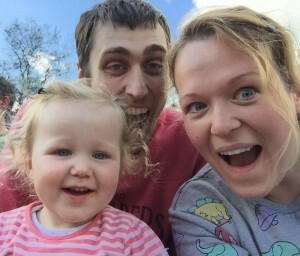 We’ve gone through the young baby stage when our activities were baby oriented: trying out lots of mum & baby groups, finding pram friendly places to eat or have a coffee, attempting to exercise (when they’d let me), and generally trying to find baby (and breastfeeding) friendly things to do and places to go! Now we’re at the running-about-mental, never-wants-to-sit-still stage, and I’m attempting to find activities, groups and places I can take them to let them both expend some of her boundless energy. I’m also on the hunt for places to eat & meet that are toddler friendly. And since toddlers go through clothes, shoes & toys at a relentless rate, I’m always on the lookout for a good kids shop or baby market. We’re always looking for ideas & new things to do/places to try out. Please feel free to contact me if we should come try out something you’re doing! I love your blog! My girl is just turning 1 so I will be following your adventures closely. We have one crazy dog, and I wonder if you also find it a challenge to find things to do with the toddler and dogs? I feel like I am constantly trying to keep the whole family happy. Thanks for a great website.